Help Keep Dog Waste Out of Our Waterways! If you take a close look at the grates for storm drains throughout the city, you will note small plaques that caution “Don’t Dump! Drains to Stream” or “Don’t Dump! 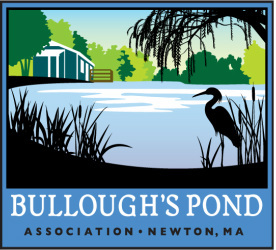 Drains to Lake.” Rainwater flows across our lawns and streets, enters the storm drains, runs through underground pipes, and empties into local ponds, the Charles River, or one of its tributaries within hours. In contrast, water that soaks into the ground takes days and weeks to filter through the soil and reach the lake. On the way, impurities are removed from the water by the process of filtration. On water’s quick trip through the storm drain system, there is no way for those impurities to be removed, and they enter local waterways. Some sources of pollution such as the phosphorus from roads can be hard to control, but there is one source of pollution that is easy to control: dog waste left on the ground near storm drains and bags of dog waste that are dropped into the grates of the storm drains. Ms. Rose explained that Public Works often discovers dumped dog-waste bags when they test the storm system’s outfalls into the Charles River and our streams for a variety of pollutants. When they get high reading of E. coli, their first reaction is to check the catch basins upstream to see whether the readings are caused by dog waste dumped there. Frequently, that is the cause. Thus, putting the bags into the drains not only endangers the quality of the water in the Charles and other waterways but also costs the city time and money to track down the problem. Dog waste that enters our waterways can pose a danger to humans: not only E. coli (for which the city routinely tests) but also Campylobacter, Streptococcus, Salmonella, and worms can be found in dog waste and be transmitted to the water where people swim. There is danger to the animals and plants that live in the water, too. Once it is in the water, dog waste begins to decompose. That process uses oxygen from the water, which is crucial for fish and plant life, and converts the nitrogen from the waste into ammonia, which is toxic to fish. Algae thrive in that environment and further degrade the water quality. What are the solutions to this problem? 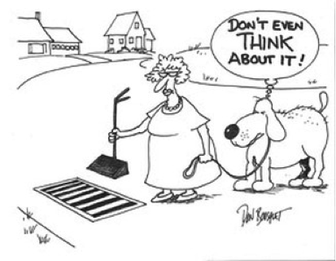 First, we need to help to educate Newton residents—and dog owners in particular—about how our storm drains work. Ms. Rose has provided the Clerk’s Office with post cards (“Please Scoop the Poop!”) for owners renewing their dog licenses. These cards also were included in a special mailing to all dog owners regarding the new off-leash dog parks. She also distributes another card that explains, “Make the Connection! Storm Drains Empty into Waterways!” Two strategies for further consideration are marking storm drains with a more explicit warning not to dispose of pet waste in the drains and increasing the number of “waste baskets” in public places. San Francisco has an “only rain down the drain” campaign and has installed nets in storm drains to catch waste. Finally, Ms. Rose suggests that anyone who sees any inappropriate items dumped in the storm drains report it to the city’s Customer Service department at 617-796-1000 or via the city’s 311 system. Republished with the kind permission of Beth Wilkinson and the Crystal Lake Conservancy.